Gallery | Our Work | ASSM&S Inc. This is the Right Side View of "The Rusty Project". This project was designed to fit just underneath the existing roof overhang. This project encompassed the enclosure of the existing patio area, as well as this All-Glass Bump-out. The other angles of "The Rusty Project" will show the rest of the patio enclosure areas. This is the Left Side View of "The Rusty Project". This project was designed to fit just underneath the existing roof overhang. This project encompassed the enclosure of the existing patio area, as well as this All-Glass Bump-out. The other angles of "The Rusty Project" will show the rest of the patio enclosure areas. 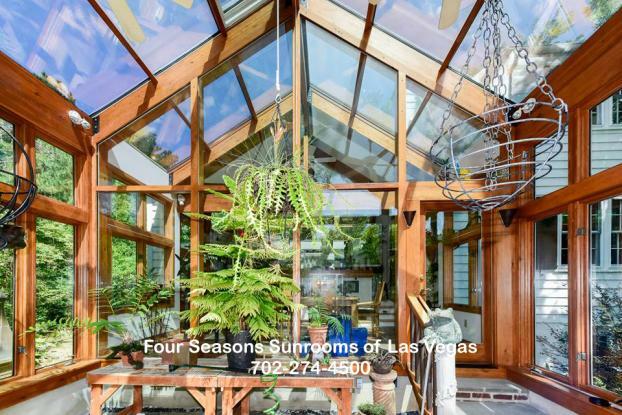 This custom designed 2nd story Sunroom features an All-Glass Wall & All-Glass Roof System, with fixed windows in the front wall, and dual sliding windows on the side sections. 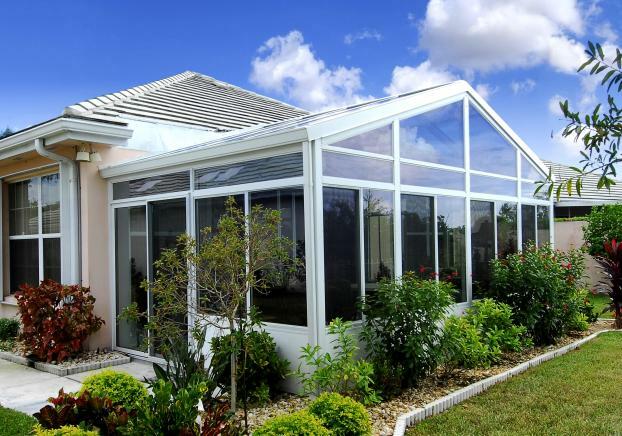 We utilized an All-Glass Roof System to to fit the customer's exact design criteria. We removed the existing stucco balcony columns, and the wrought iron railings, to allow for the final architectural plan. 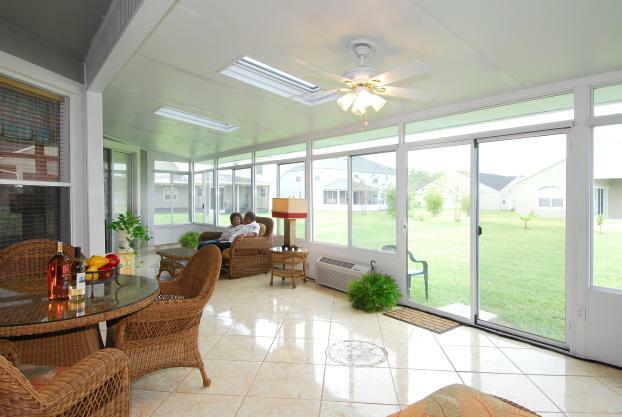 This Sunroom was designed to fit directly on the existing 2nd story deck, just outside the master bedroom. This room features an All-Glass Wall System. We utilized 24" lower glass base panels below the windows, and 12" glass transoms above all windows and doors. We utilized a special Insulated Roof Panel System that allows for hidden electrical and mounting of circulating fans, as well as two custom skylights. 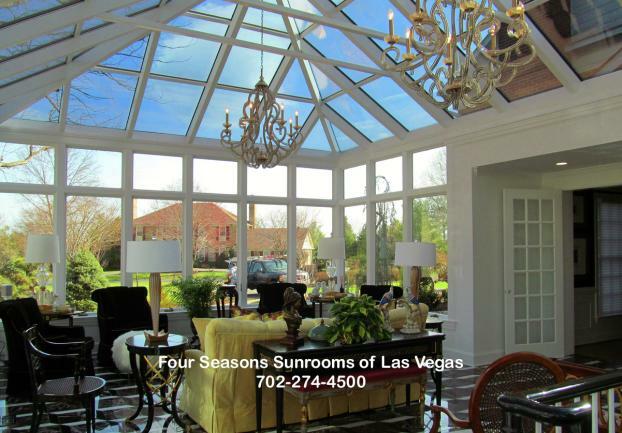 This Sunroom Home Addition offers an all glass roof with dual sliding windows and an extra wide French Door. 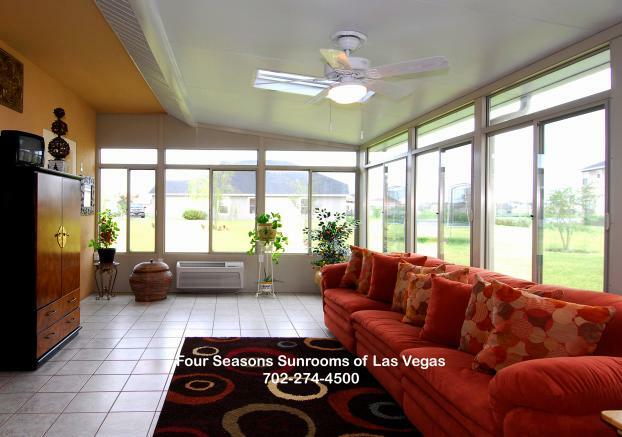 This Sunroom was also designed with A/C and Heat for year round use and enjoyment. 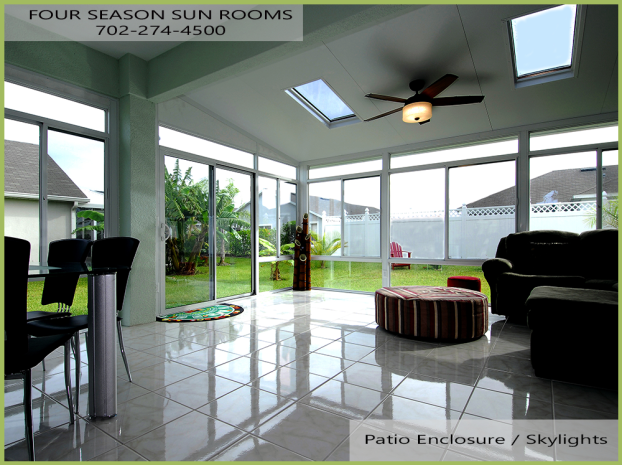 The custom tile floor was an added extra to complement the Sunroom as well. This is an awesome example of enclosing your back patio area for added space to your home while creating an exercise area combined with a pool table & open bar for entertaining. 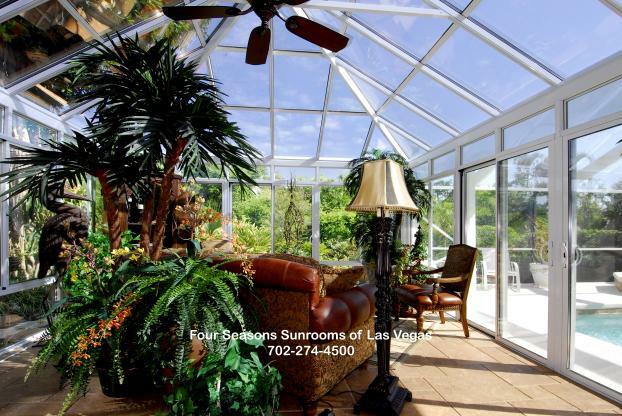 This Sunroom combines openness with a positive feeling to enhance your Quality of Life Style. 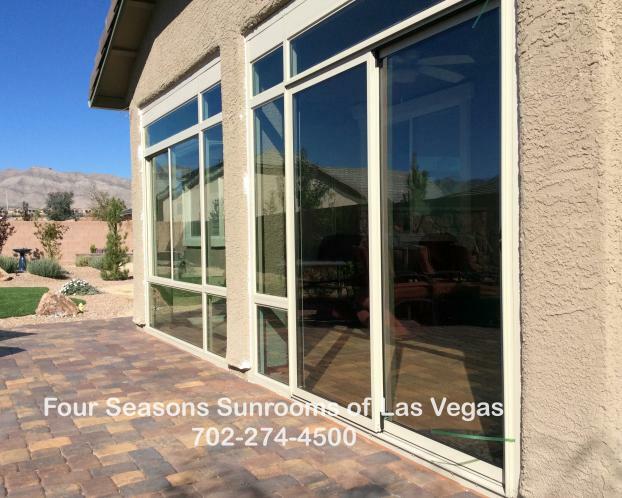 If you are interested in enclosing or bumping out your patio, please feel free to give us a call at 702-274-4500. We look forward to the opportunity to work with you. This project included the removal of the existing house walls, to allow for the Curved Glass Sunroom extension. 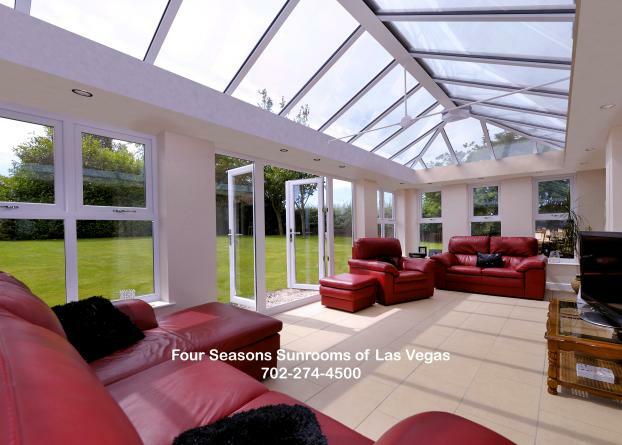 We used a special sloping Curved Glass Roof Design, to create an incredible openness to the existing living room area. 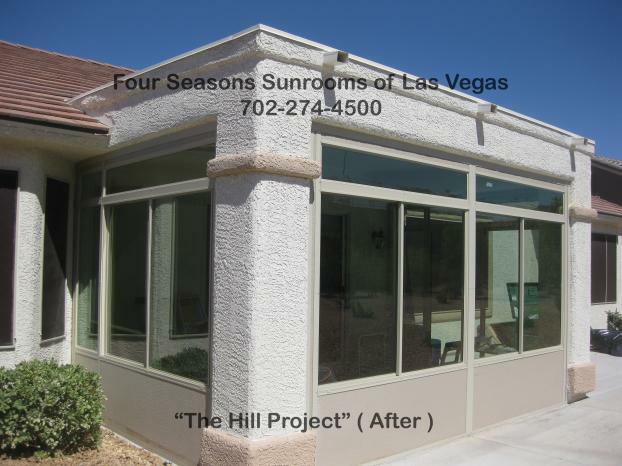 This Sunroom Addition not only complimented the house, but the entire backyard and spa area as well. 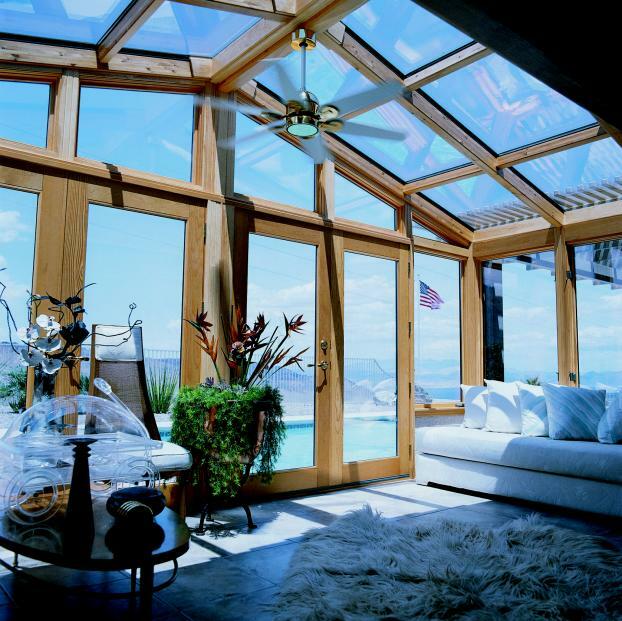 An absolutely awesome example of our Curved Glass Sunrooms. 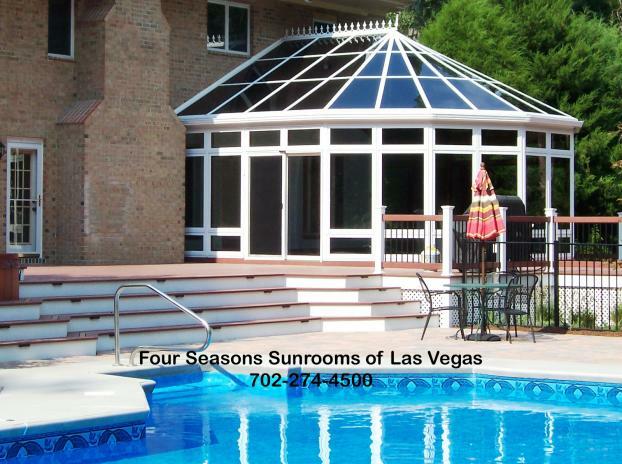 These Sunrooms come in a variety of sizes and layout options to fit your needs. This project allowed for a nice extension from the existing restaurant patio area. We utilized a combination of the Curved Glass Roof Design, with a Straight Front Glass Wall option, which included all dual sliding glass windows. This extension/remodel included a complete A/C and Heating Unit Package, along with extensive electrical work and a complementary Tile Floor Package as well. To answer any questions about commercial or business related projects, please call 702-274-4500. This project was designed to enclose the existing patio area at the rear of the home, and include a custom Curved-Glass Bump-out from the existing patio roof area. 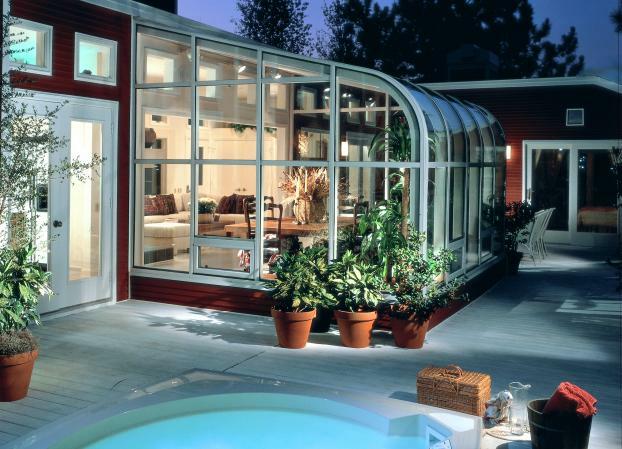 This Curved Glass Design featured an All-Glass Front Wall System with dual sliding windows, and an All-Glass Curved Roof System. After the completion of the remodeling project, there was over 500 square feet of new usable space to compliment the home. The new space offered room for a pool table and exercise equipment. This project was designed to meet the customer's exact needs. They wanted a single bay Curved Glass Sunroom Bump-out, with a large 4 Panel Quad Sliding Glass Door System in the front wall. The project also included the removal of the existing stucco wall surface, which was replaced with sheet rock, textured and painted to match the existing style of the house. The room also featured a Tile Floor Package. 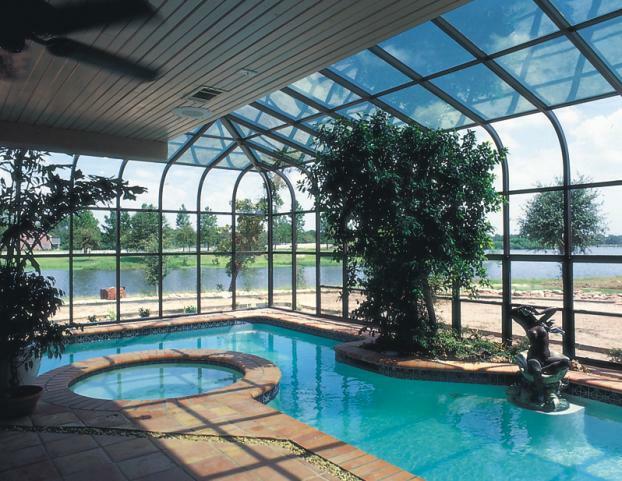 This Patio Enclosure offers a great outdoor feeling with the comforts of being inside. Custom projects like this one are our specialty. 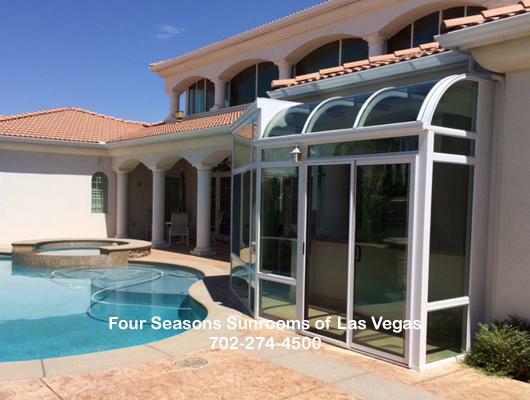 Four Seasons Sunrooms has been designing custom Pool Enclosure Projects for residential, commercial, and industrial applications for over 40 years. The majority of the projects like this are custom designed to fit our customer's exact needs and/or desires. 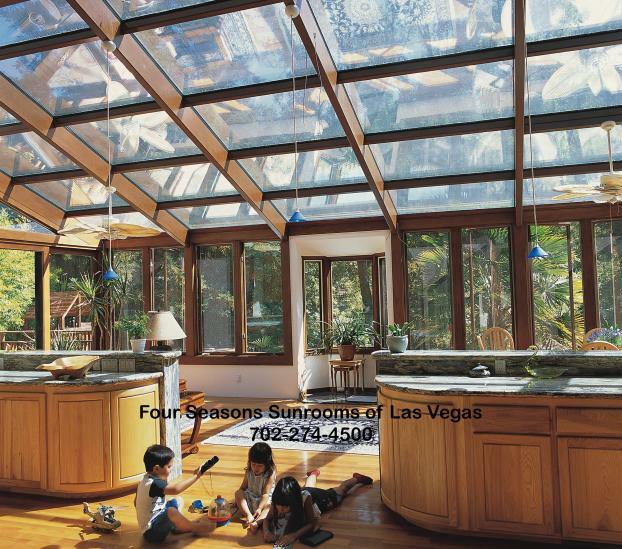 Should you have any questions in regards to Pool Enclosure Projects, please feel free to call us at 702-274-4500. 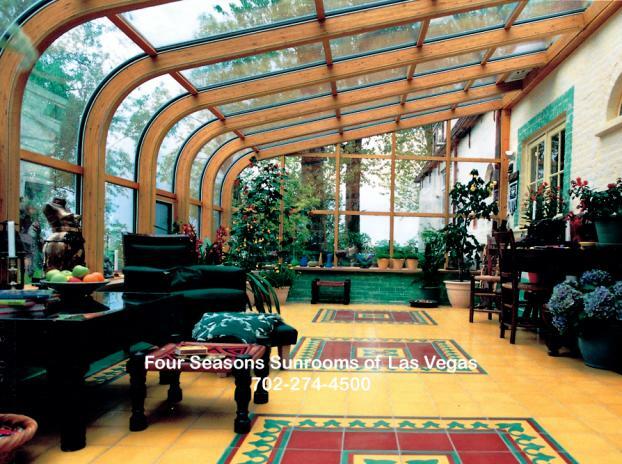 This project utilized our custom Low-Boy Curved Glass Design Sunroom materials. This area was created as a sitting- or reading-room. This is one of our Curved Glass Sunroom Designs which offers a low attachment area to the house, creating an unparalleled feeling of being outside, with the comforts of being in your own home. These rooms are airy and unique in what they offer, both in design and use-wise. A great option for small or limited areas. A great Bump-out design! This is a custom Curved Glass Wall System, featuring an impressive extended height option. 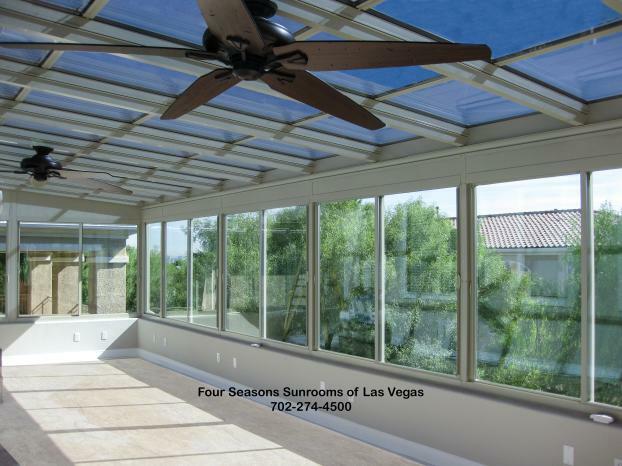 The All-Glass Curved Roof System meets a 10' High Custom Front Glass-Wall System. 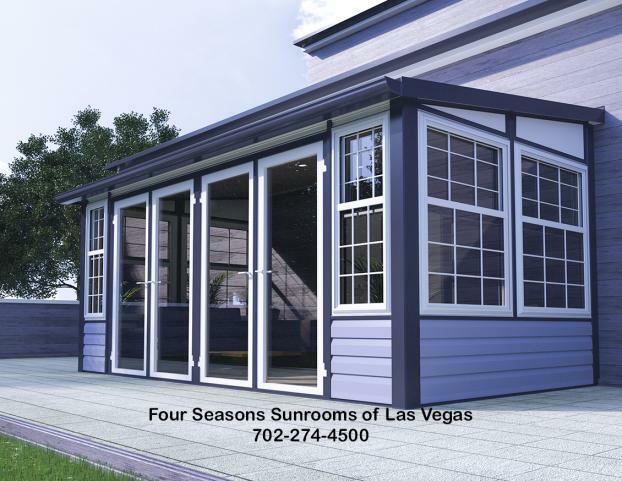 The custom design options for your sunroom are endless! 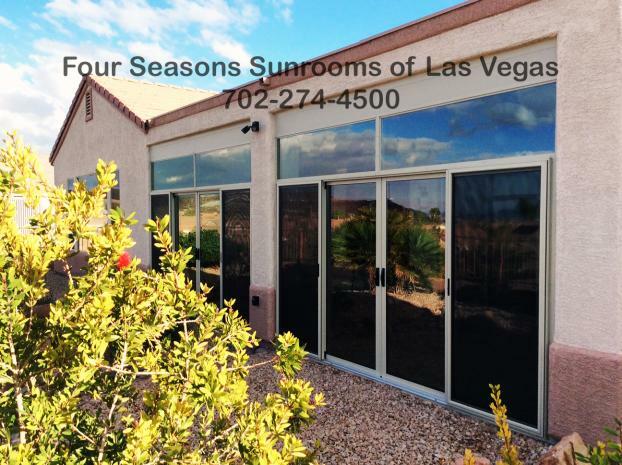 The dual sliding glass windows, glass transoms, and sliding glass doors can be configured in any option that you can imagine. 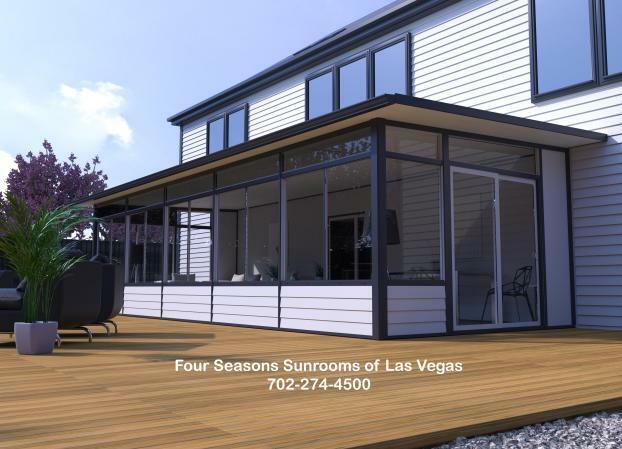 If you'd like to start designing your custom project today, please give us a call at 702-274-4500, and we will work with you on your design. 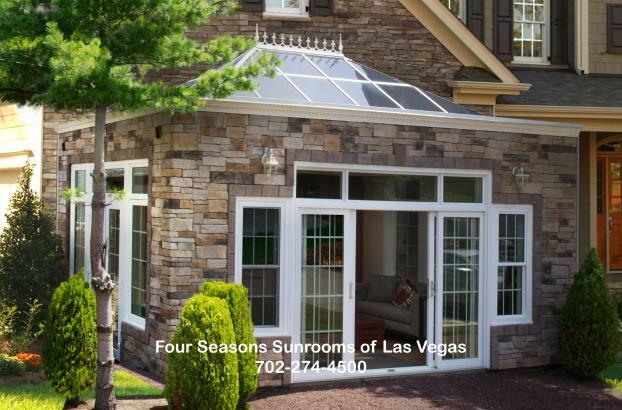 This Cathedral Sunroom offers a 24" solid Lower Base Wall System below the dual-sliding windows. This room features 12" glass transoms above all the windows and doors, and glass trapezoids above the transom windows. The Cathedral designs always feature a high ceiling, which creates a unique openness to your backyard view. This ceiling area was replaced with a custom designed with an All-Glass Cathedral Canopy System. 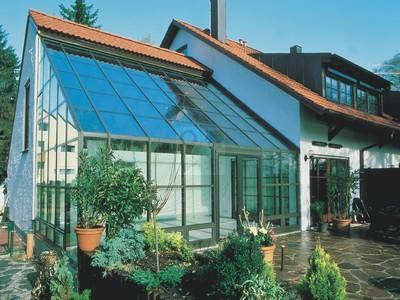 These Canopy Glass-type Systems can be done in a variety of sizes and shapes, to meet our customer's needs and desires. Most of these systems are custom designed for the actual application requirements. Please give us a call with any questions at 702-274-4500. We always provide Free Estimates for our customers. 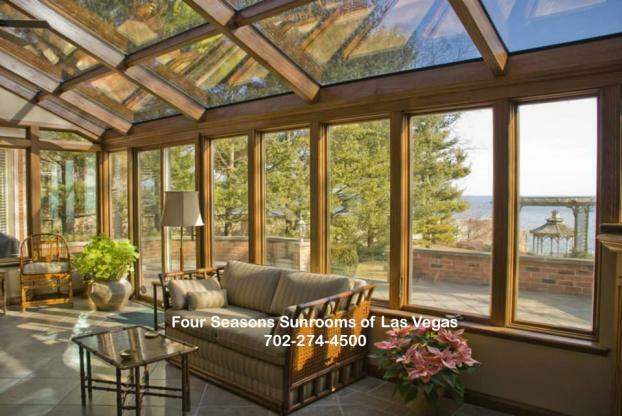 We offer a large variety of Sunrooms with different types of wood framing and trim work. This project was completed with beautiful oak wood framing materials, in both the roof and lower wall areas. This project featured large 6' wide custom French-Style Doors in the front Glass Wall System. All of our custom wood trim designed rooms create an incredible, ornate atmosphere. 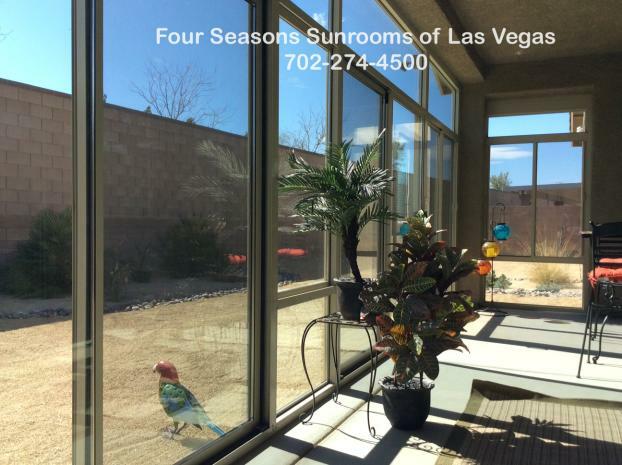 For more information on these rooms, give us a call at 702-274-4500. This project was designed as an extension of the dining room area. We renovated the existing roof line to allow for the custom designed conservatory attachment. This conservatory was designed with Automated Roof Skylights, to allow for additional ventilation. An electrical upgrade to allow for new lights, an A/C, and a fan was also included as part of this renovation project. The roof tiles were reset to compliment the new glass conservatory roof line, creating a seamless new look. 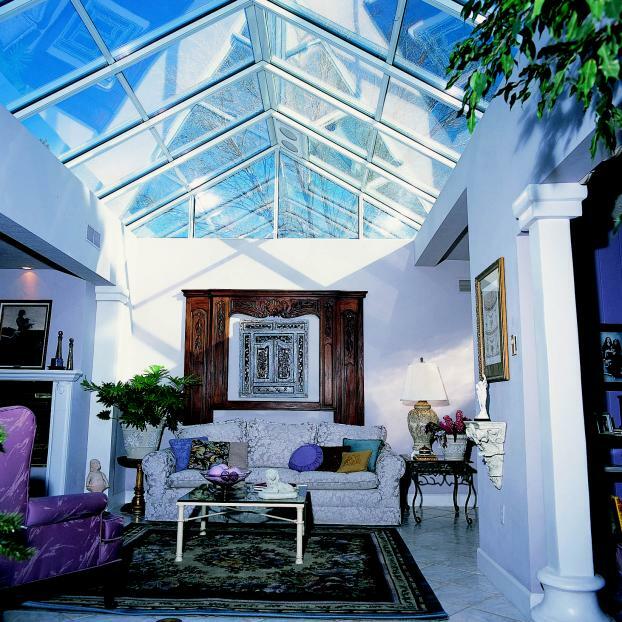 This project was designed with an especially high-pitched All-Glass Roof System. The side wall section and front section were designed as All-Glass Wall Systems as well. This Sunroom design utilized our bronze-colored aluminum framing material, with special roof glass that had an extra blue featured color. 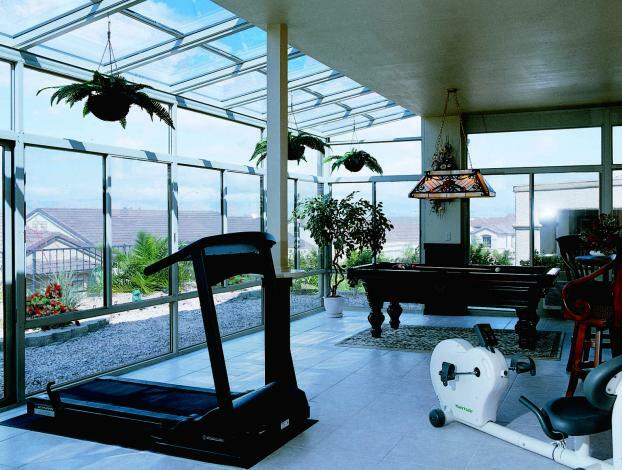 This High-Pitched Glass Conservatory was designed to be an extension to the living room for entertaining. 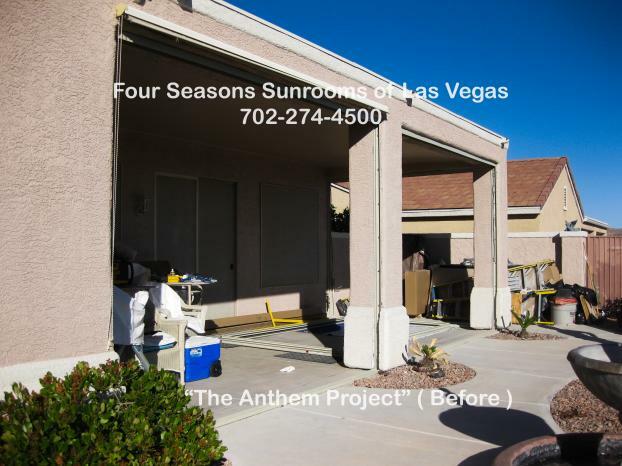 Feel free to call us with any questions or for a Free Estimate at 702-274-4500. 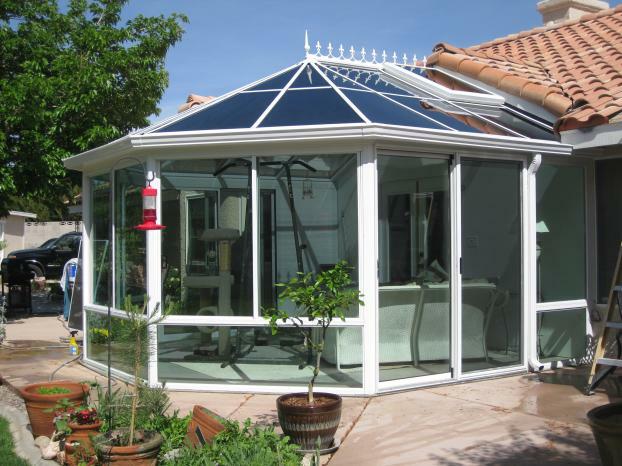 Cathedral Sunrooms can be designed with a wide variety of options, depending on our customer's needs. For example, this room used extremely large, airy, trapezoid windows above the front doors, to really give you that openness feeling. This was a Solid Roof Cathedral, with custom skylights on both sides. 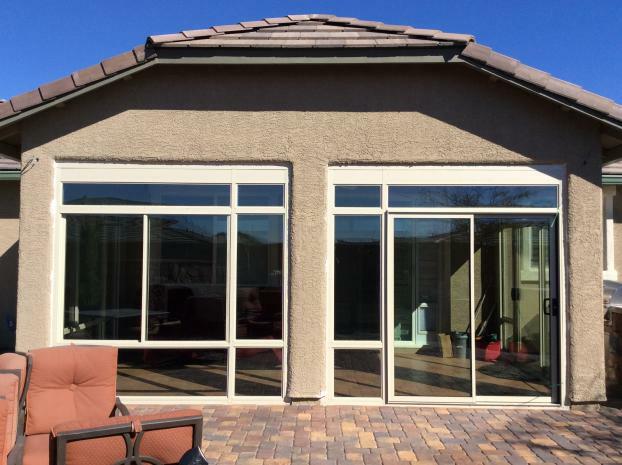 This Solid Roof Patio Enclosure System features a combination of sliding glass doors and dual sliding windows. 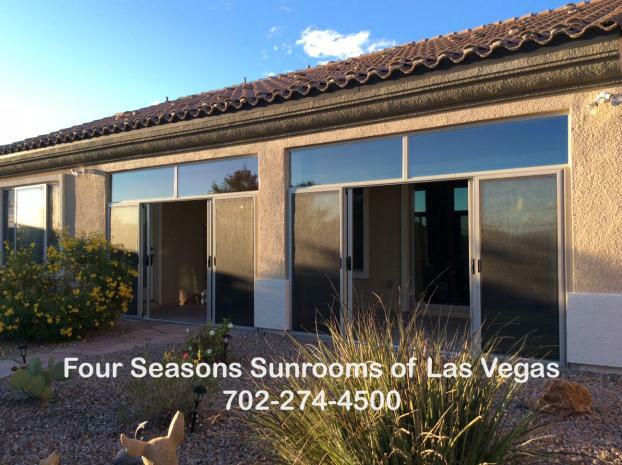 We used 12" glass transoms above all windows and doors. This room also utilized custom skylights in the solid, insulated roof panels. 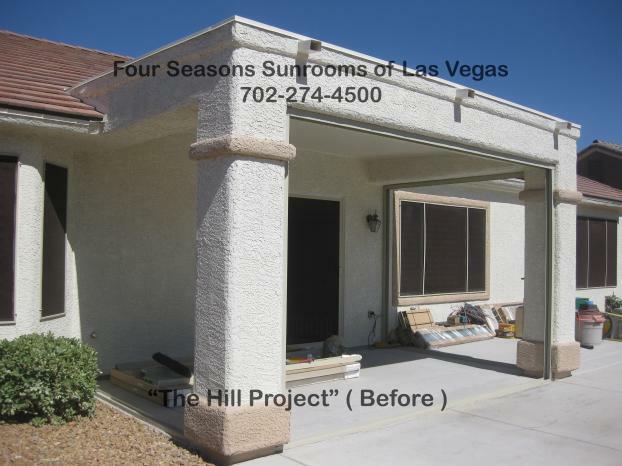 This project was completed with an A/C system, and custom fans. 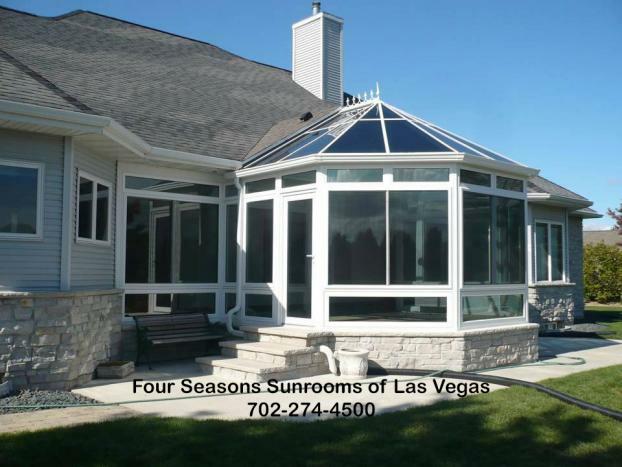 This Sunroom Design features a combination of dual sliding windows, with 12" glass transoms. We utilized our special Insulated Lower Base Panels below all the windows. 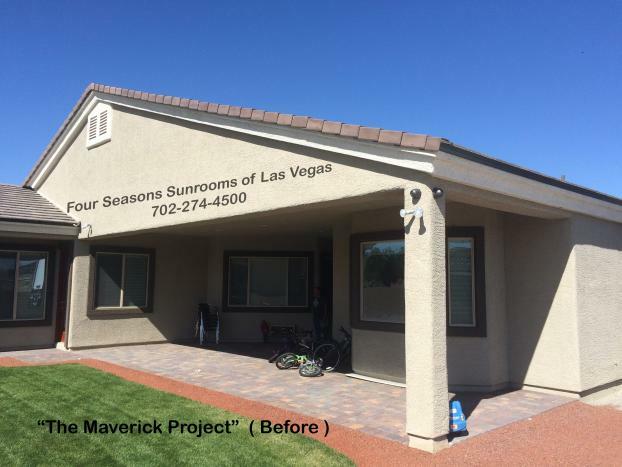 This project featured a Solid Insulated Roof System, with a gutter and downspout. Our dual sliding windows all feature custom sized screens that can easily be removed for cleaning purposes. The existing patio area, at the customer's request, was enclosed by utilizing two custom 12 foot 4 Panel Quad Doors in each front opening. We utilized 24" glass transoms above both Quad Door Systems. All Quad Doors come with custom screens, which offer the dual sliding effect as well. This patio was approximately 26' wide, with a projection of 12'. The newly enclosed area (with A/C!) creates an additional 312 sq. ft. of usable space for their home. This was an existing covered patio area, with stucco columns, where we designed the Glass Wall Systems to fit within the covered patio openings. 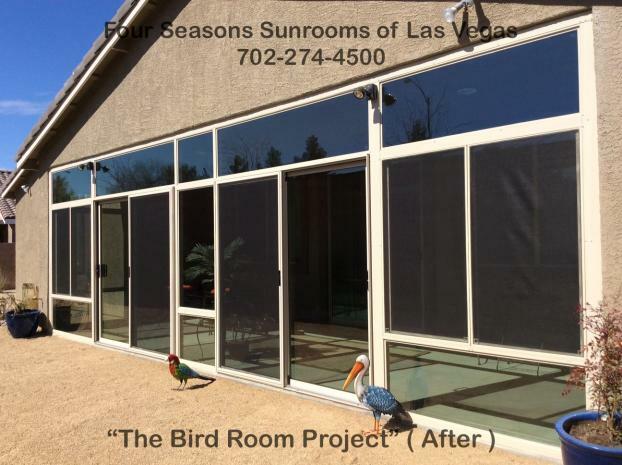 We utilized a combination of fixed windows, dual sliding windows, as well as sliding glass doors, to enclose the existing patio area. 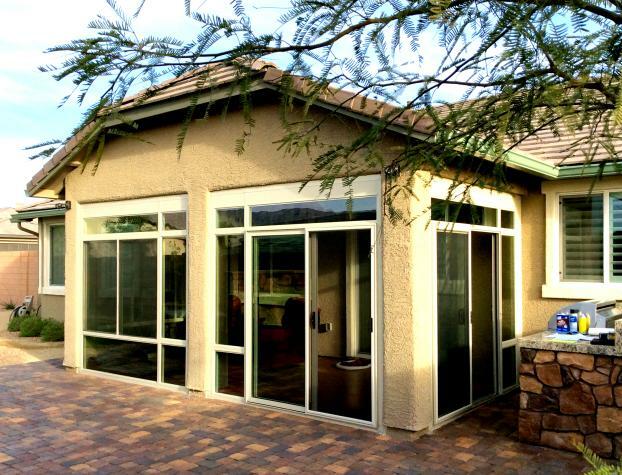 This was an existing covered patio area built with the home originally which we enclosed with specially designed fixed windows, dual sliding windows and sliding glass doors. This enclosure featured all glass base windows and all glass transom above the windows for an additional open view of the back yard surroundings. This Patio Enclosure was custom designed with glass walls to exactly fit within the openings of the existing patio roof and column areas. We used our custom 4-Panel Quad-Door System here, with 2 dual sliding windows on each side. 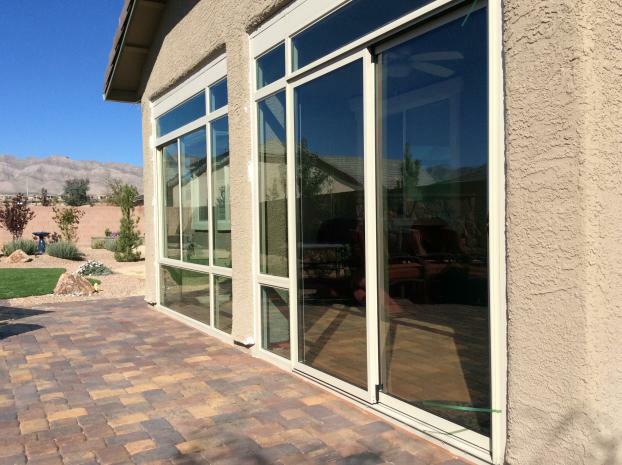 This project features custom height glass transoms to further enhance the openness of the new Patio Enclosure. We have other pictures of "The George Project" in the gallery. 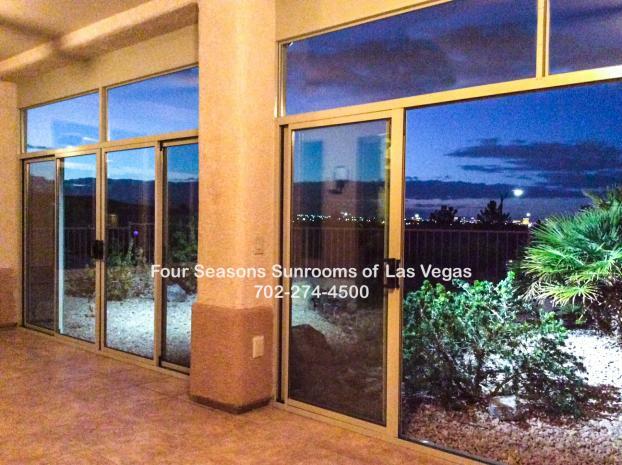 The size of the 4-Panel Quad-Door System really offers easy access in and out of the room. 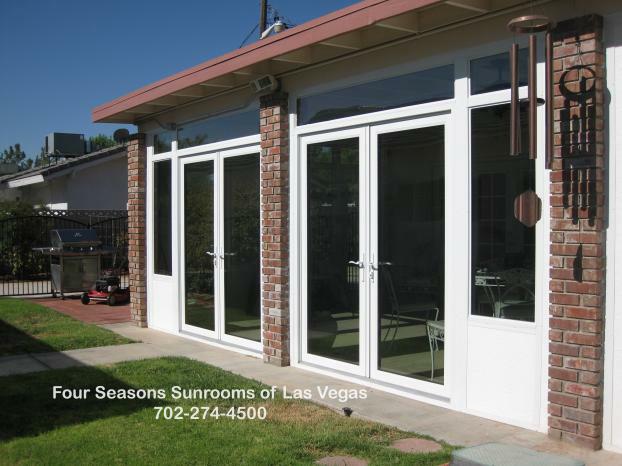 This Patio Enclosure features two sets of custom 4-panel quad-doors, with 24" glass transoms above. All quad doors come with specially designed screen doors. This patio originally had curved stucco arches that were removed to allow for the new glass wall system. 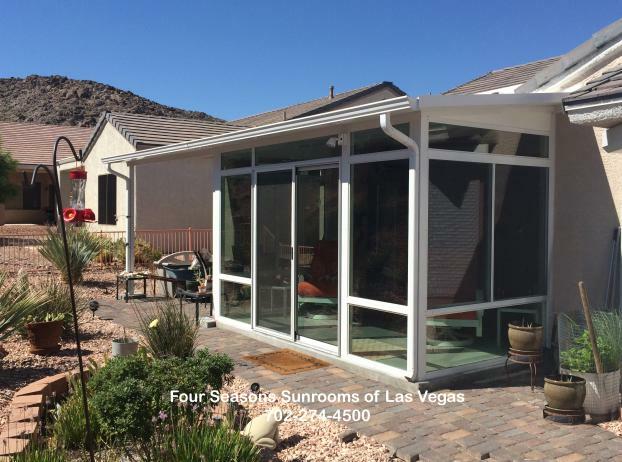 This Patio Enclosure project features 24" glass base panels, and 12" glass transoms, with white framing to match the existing house window frames. Although you can't see it in this picture, there is a set of French Doors on the other side of the Patio Enclosure. 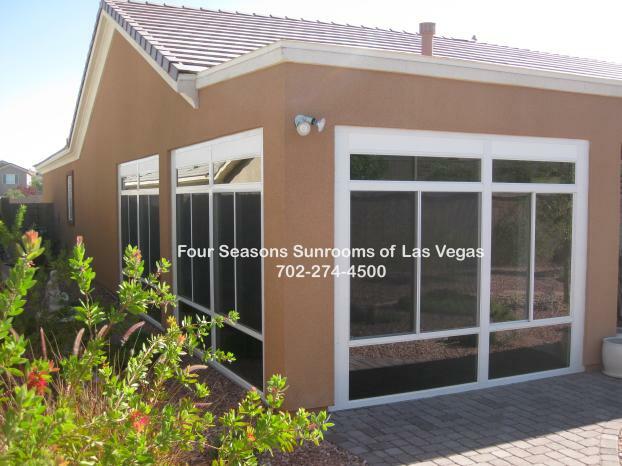 This Patio Enclosure features 2 sets of 4-panel quad-doors, which include screen doors. It also features a small dual sliding glass window on the side section. 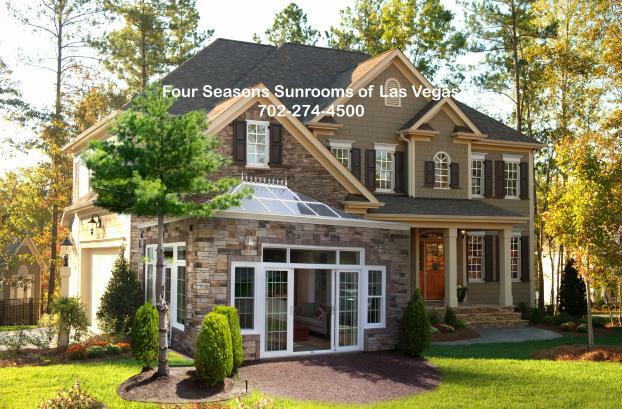 There are 24" glass transoms above all windows and doors. 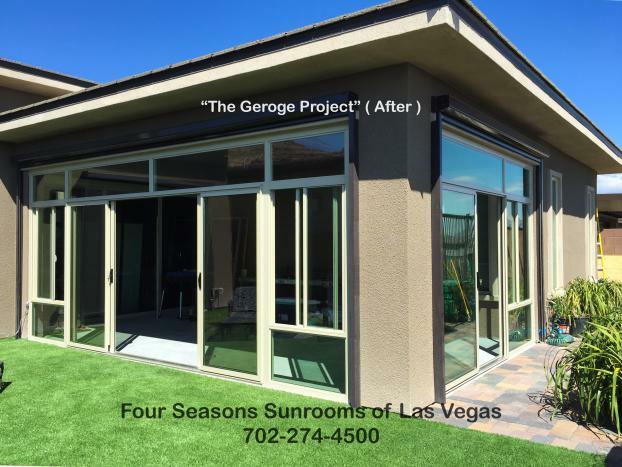 This patio originally had curved stucco arches at the top corners, and they were removed and re-framed with new stucco to allow for a precise fit of the new glass wall system. Click on any photo for details on that project! Have any questions about a project you see here? Please feel free to call us and we'll be more than happy to answer any of your questions on any project you may see here. We also would be more than happy to look at your project personally with you, and give you a free estimate. 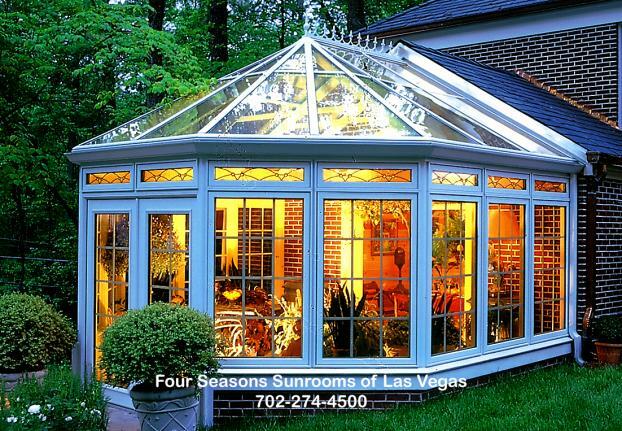 Feel free to call us at 702-274-4500. We can also mail out brochures for you. The Interior View of this Patio Enclosure features beautiful French-Style glass doors, with 12" glass transoms above the doors. We utilized two small fixed windows on each side of the French Doors. This Glass Wall System was designed to fit between the existing patio's brick columns. 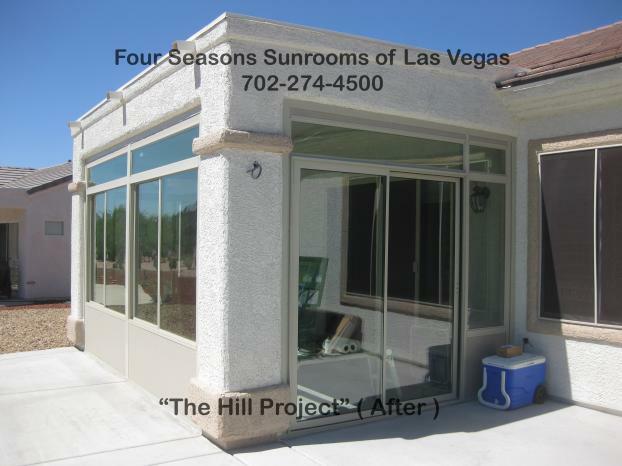 This "Before" picture will give you a great feel for the patio area to be enclosed with our Glass Wall Systems. In the next picture, you will see "The George Project" after work has been completed, taken from the same corner view. 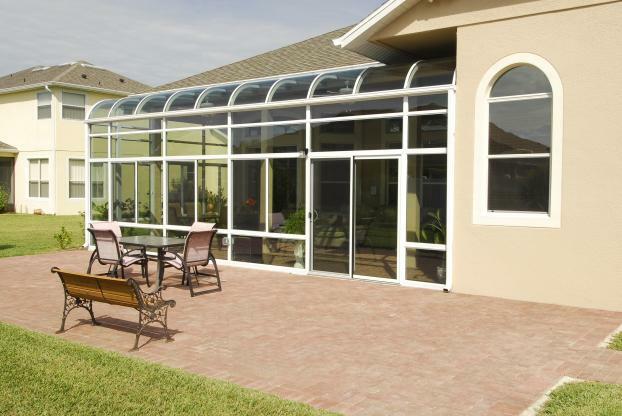 This Patio Enclosure features 2 Glass Wall Systems. The side is a 7' door with windows and transoms, and the front section utilized our custom 4-Panel Quad-Door System. 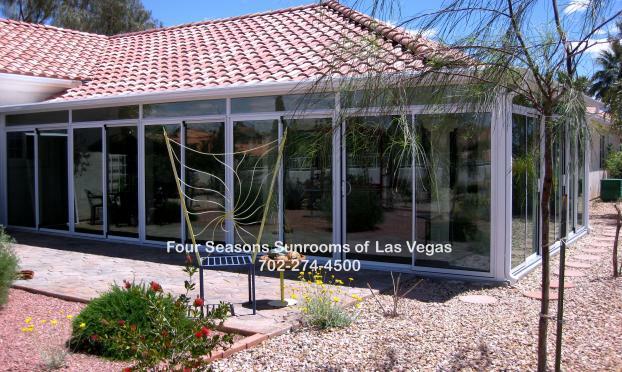 This project had 24" lower glass base panels, with 24" glass transoms above both the windows and doors. There were 2 dual sliding windows positioned on each side of the 4-Panel Quad-Door System for extra ventilation. The interior view of this Patio Enclosure shows how we enclosed an existing covered patio area that was attached to the house. 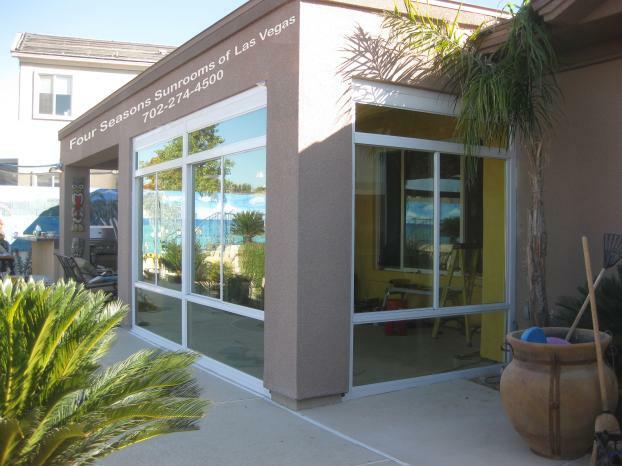 We designed our Glass Wall System to fit perfectly between the front stucco support columns. 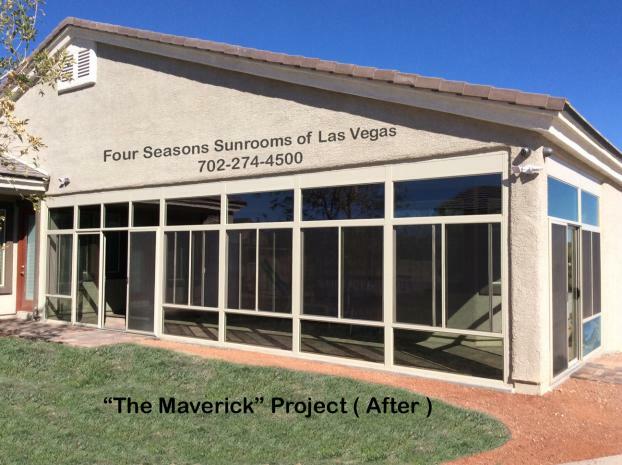 This project featured 24" Lower Glass Base Panels and 24" Glass Transoms above the windows. 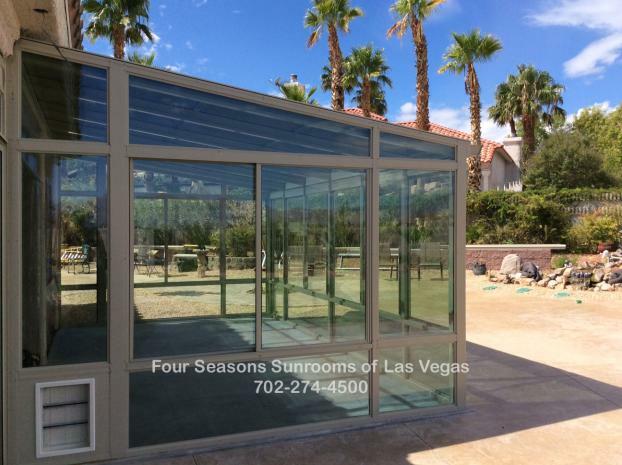 This enclosure was completed with a Mini-Split A/C unit, to offer year-round usable space. 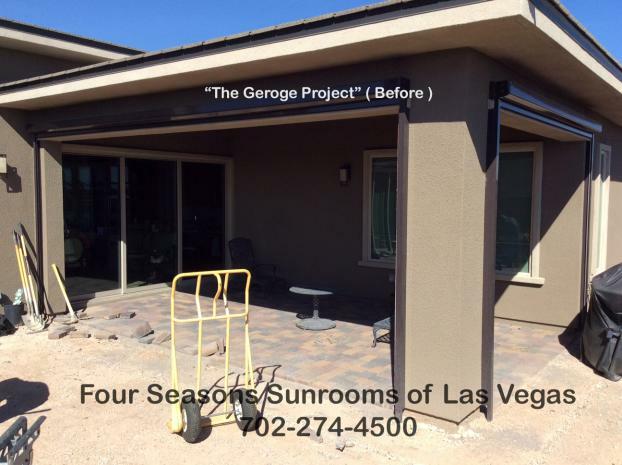 This is a great example of enclosing an existing patio structure. This area was approximately 200 square feet. The constant dust, wind, and weather conditions left this patio virtually unusable for the majority of the year. 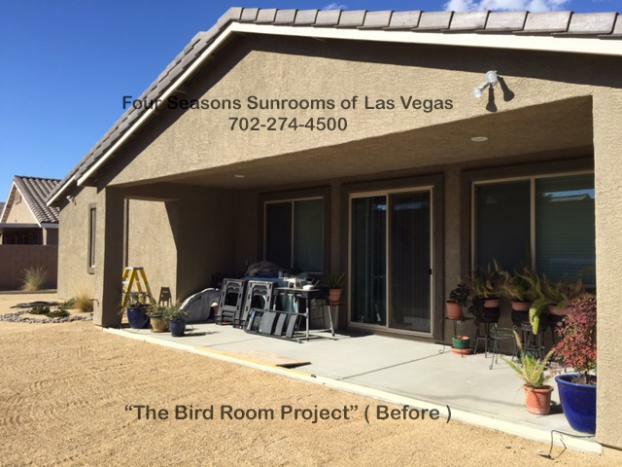 The customer's desires were to add additional space to their living and dining room areas by enclosing the patio, and picking up additional square footage. Our glass wall system is designed for situations just like this - turning unusable space into a usable area. This is the completed "Hill Project". This project was done with special insulated base panels below the windows, at the customer's request. 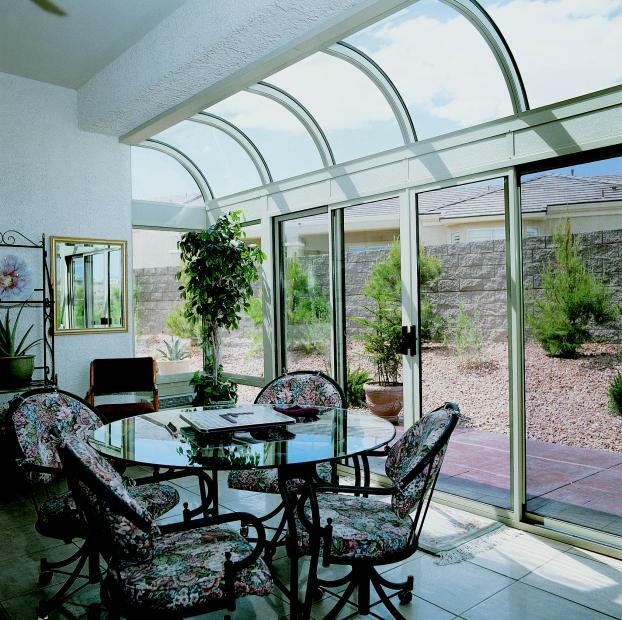 The Patio Enclosure features dual sliding windows for easy ventilation, with 12" Glass Transoms above. Our Glass Wall System was designed to fit within the existing rear patio structure, and we used framing materials to complement the existing house colors. 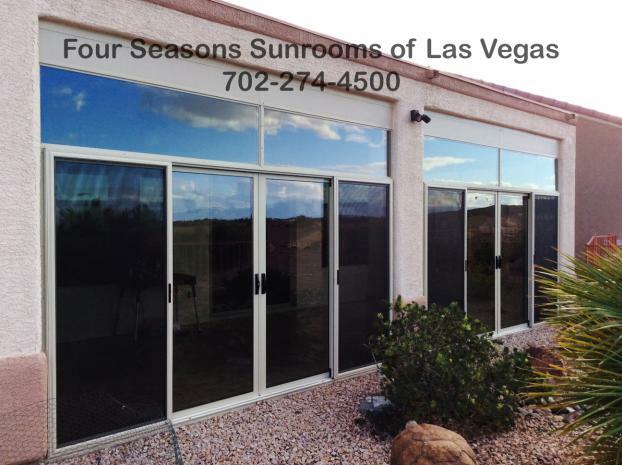 This Patio Enclosure exclusively features 6' glass doors, at the customers request. We utilized 12" glass transoms on top of the glass doors. The area enclosed was in excess of 400 square feet. 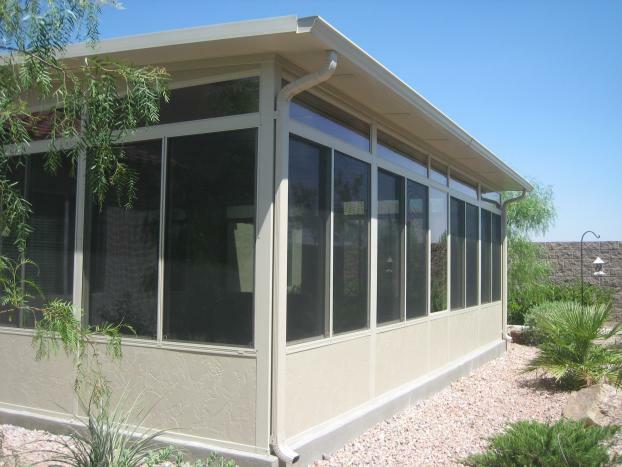 This is a great example of a covered patio area that can be enclosed with our glass wall systems. This area is open to weather year-round, and is not actually usable for the majority of the year. One of the main reasons we enclosed this area was our client's needs for having a special additional area for her birds. By enclosing the area, her birds now have a nice sanctuary! Click on the next photos to see the finished product. This is the finished "Bird Room Project". This enclosure was designed at the customer's request to be a little bit unique. 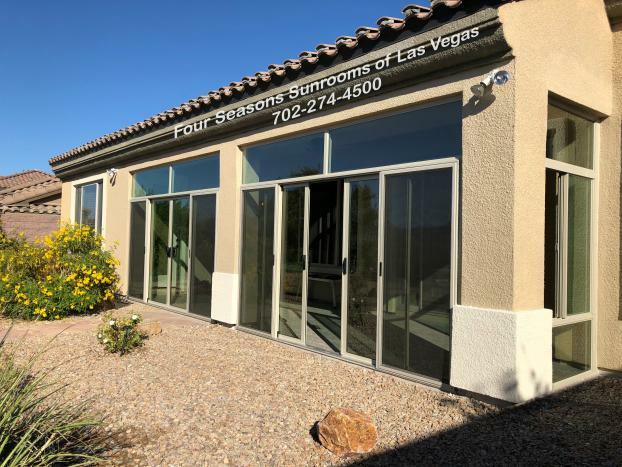 We utilized a fixed window in the center area, with two custom sized 7'-wide sliding glass doors on each side, accompanied with two dual sliding windows. This is a great example of picking up an additional 400 square feet of usable area out of an existing rear patio. The birds love their new Patio Enclosure, and the security it offers! The interior view of this Patio Enclosure features beautiful French-style glass doors, with 12" glass transoms above the doors and small fixed windows. This glass wall system was designed to fit between the existing patio's brick columns. This is the finished "Bird Room Project" patio area view. This enclosure was designed at the customer's request to be a little bit unique. 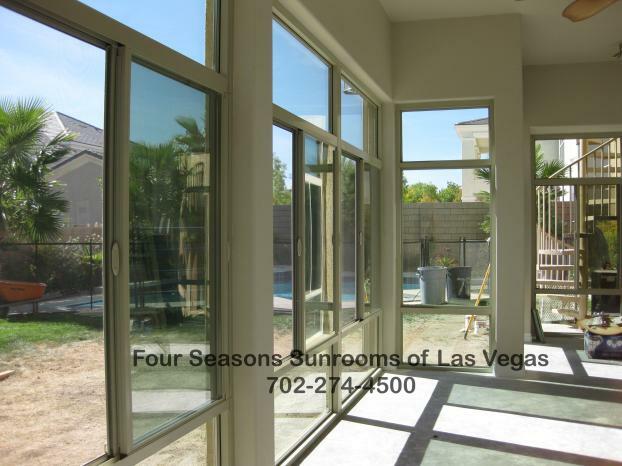 We utilized a fixed window in the center area, with two custom sized 7'-wide sliding glass doors, as well as dual sliding windows. 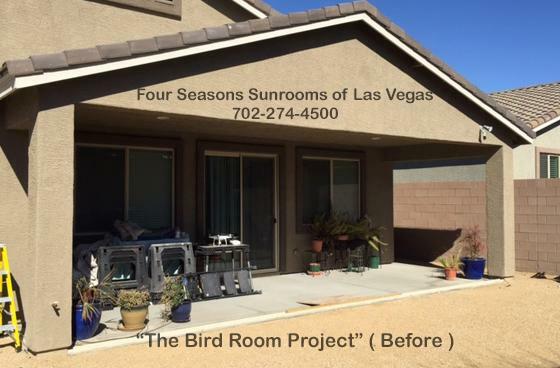 This is a great example of picking up an additional 400 square feet of living space out of an existing rear patio. The birds love their new Patio Enclosure, and the security it offers! This existing patio area was around 10' x 20' in size. This patio area offered a nice extension to the living room and dining room areas. We utilized an insulated base wall system at the bottom of the window wall. The side area was designed with 6' sliding glass doors, and a small fixed window section. The front windows were dual sliding, for added ventilation. This picture was taken before the project began. Click on the next picture of the completed project to give you an idea of how valuable enclosing your patio area can be! 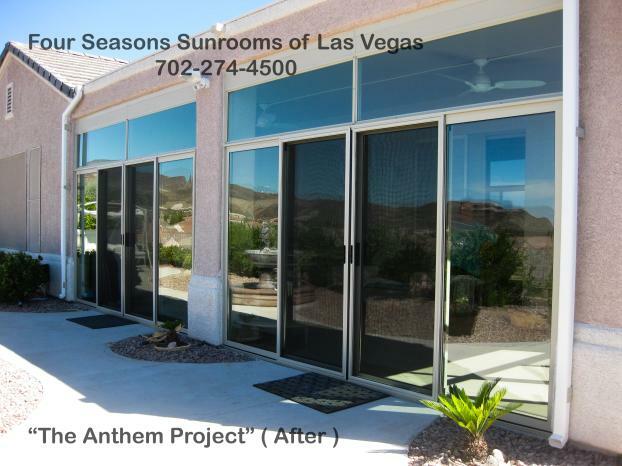 This is the right side view of the completed "Anthem Project", featuring two 4-panel quad-door systems, and 24" glass transoms. This added around 300 square feet of usable space to their home. 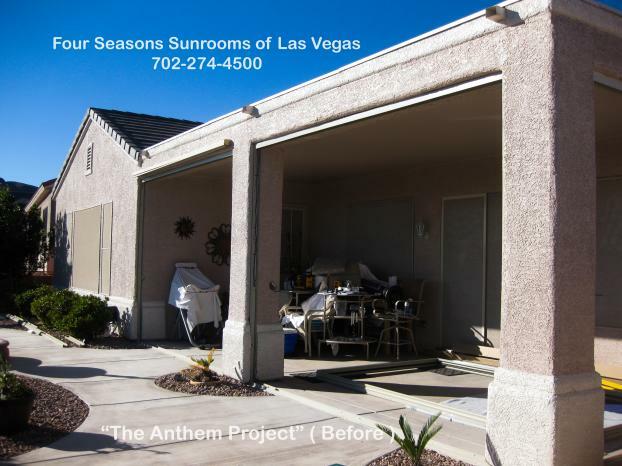 This new enclosure allows the homeowners to enjoy their patio without the normal problems of wind, dust, dirt, heat, and uncontrollable weather. 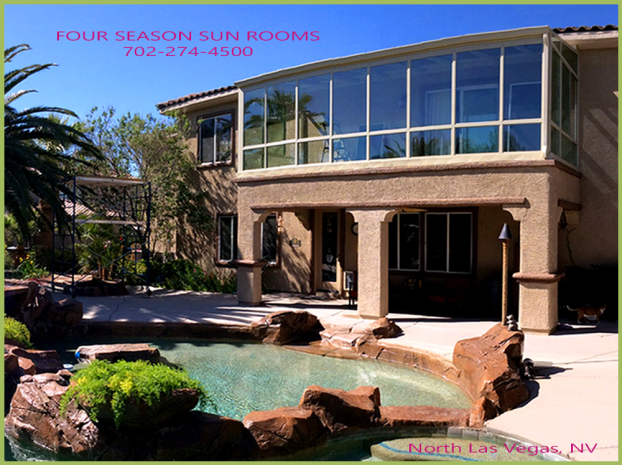 Feel free to call us if you have any questions, at 702-274-4500! Want a free estimate? Call us! 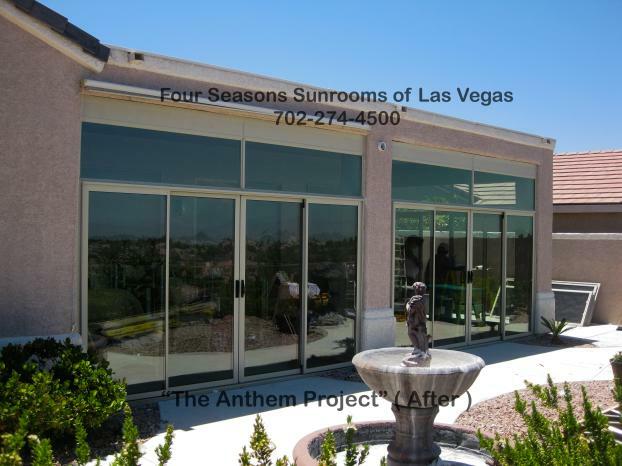 This is the left side view of the completed "Anthem Project", featuring two 4-panel quad-door systems, and 24" glass transoms. This is a good example of adding additional usable square footage to your home. 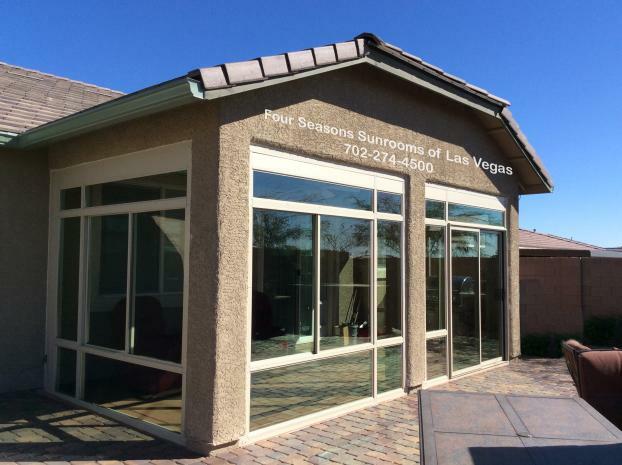 This new enclosure allows the homeowners to enjoy their patio without the normal problems of wind, dust, dirt, heat, and uncontrollable weather. 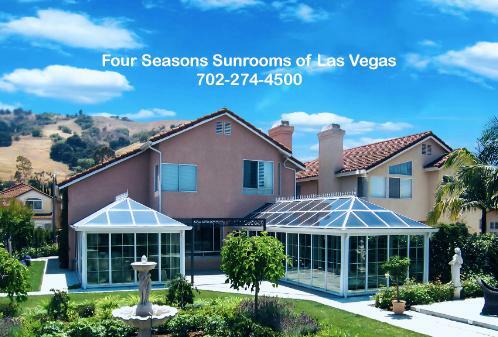 Feel free to call us if you have any questions, at 702-274-4500! Want a free estimate? Call us! 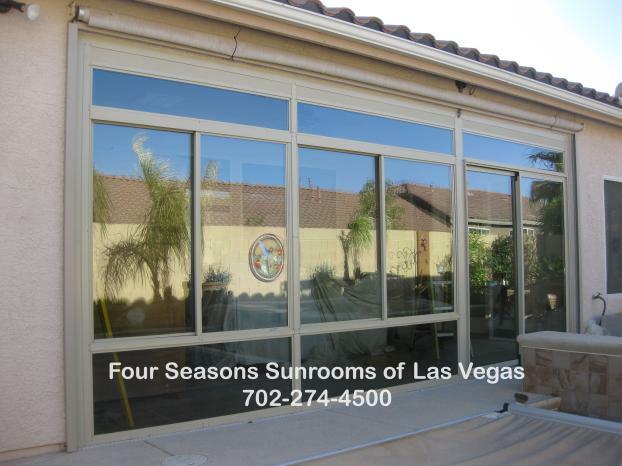 This Patio Enclosure features two 4-panel quad-door systems, as well as 24" glass transoms. 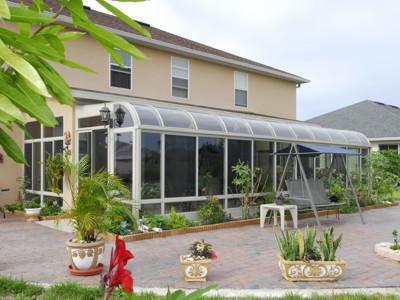 Take full advantage of your backyard area all year with a Patio Enclosure! 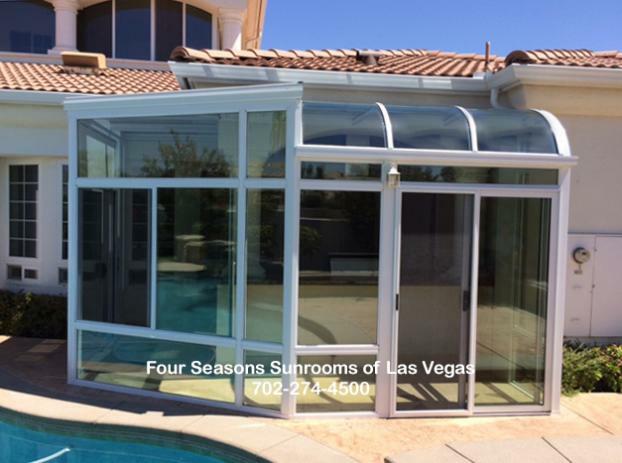 This Patio Enclosure features two 4-panel quad-door systems, sliding dual windows on the right side section, as well as 24" glass transoms. 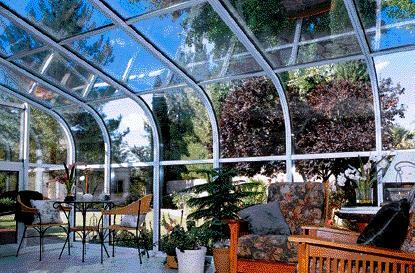 Take full advantage of your backyard area all year with a Patio Enclosure! This is the patio area to be enclosed ( before work starts ). See next photo for the finished product! 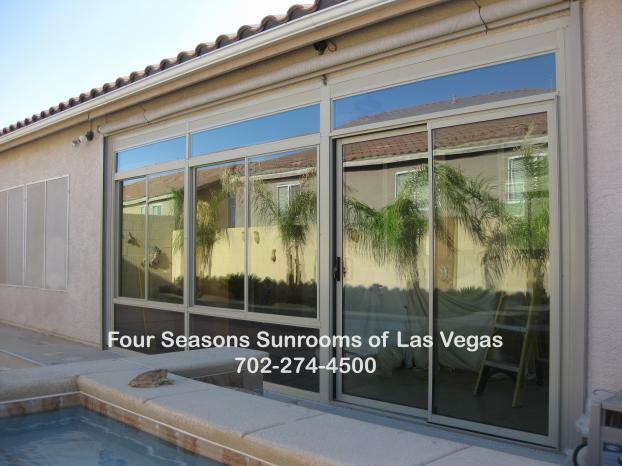 This Patio Enclosure features a custom 3 Panel Sliding Door System, combined with dual-sliding windows. 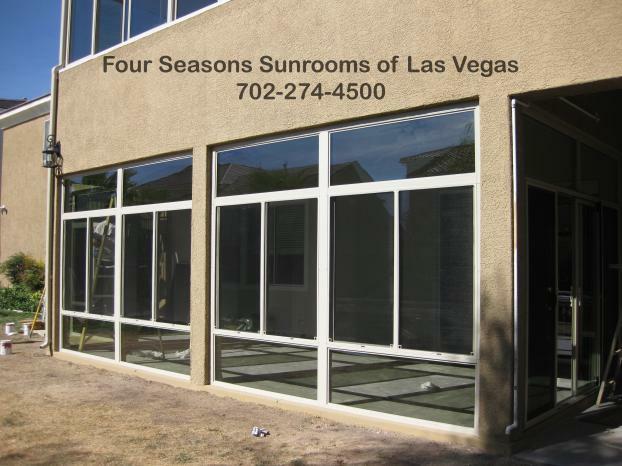 We utilized 24" lower glass base panels, and 24" glass transom above all windows and doors. 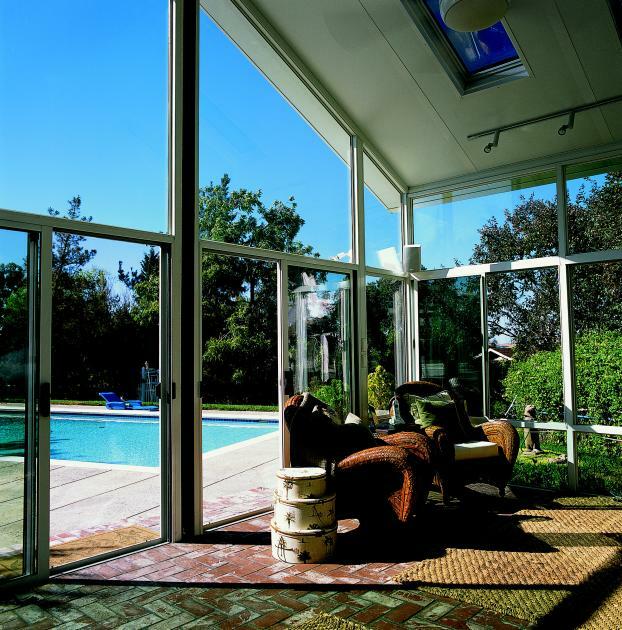 This glass wall system enclosed an existing 8' x 24' rear patio porch area by the pool. 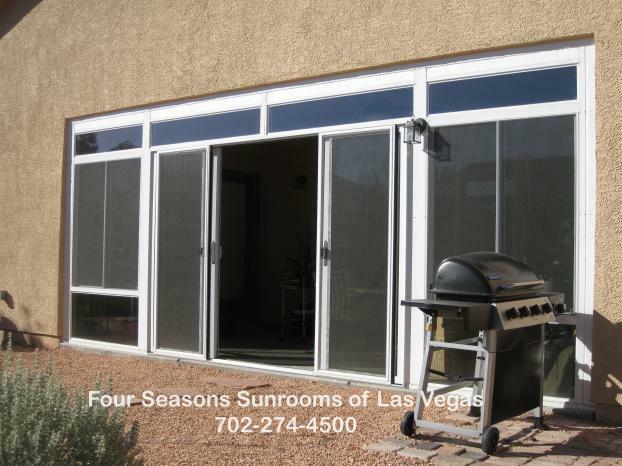 This Patio Enclosure features dual sliding windows, a sliding glass door, with 24" lower glass panels and 12" glass transoms above the windows and doors. 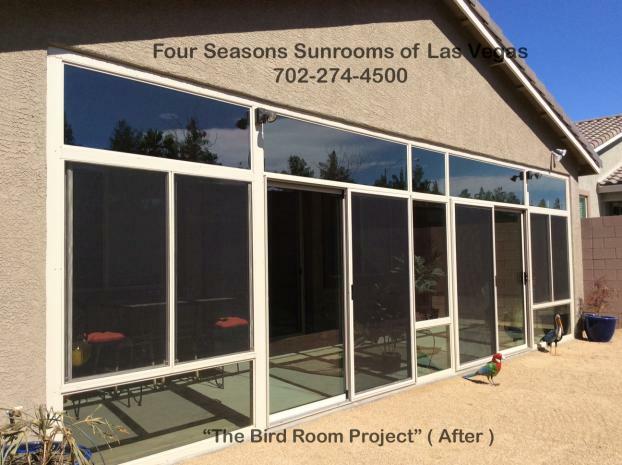 This project demonstrates how easily a Patio Enclosure can increase your usable living area. 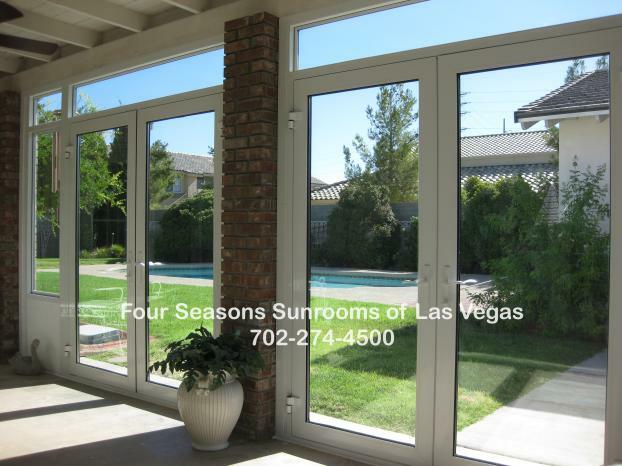 These glass 4-panel quad-doors always feature screen doors, and make using your new patio area a breeze. 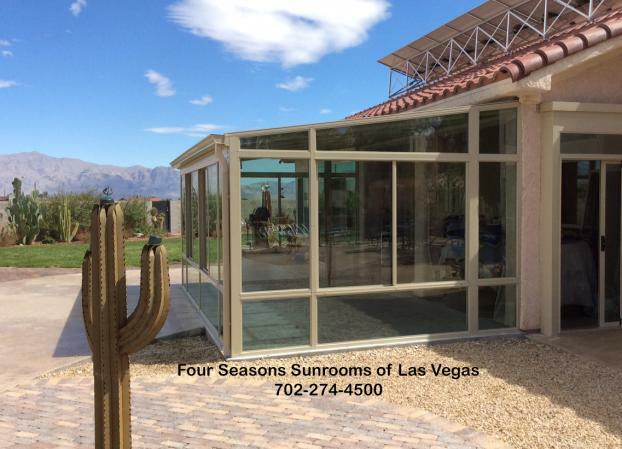 We utilized 12" glass transoms to fit the existing patio opening perfectly. This project featured both a lower Patio Enclosure, as well as a custom all-glass second deck sunroom connected to the master bedroom. 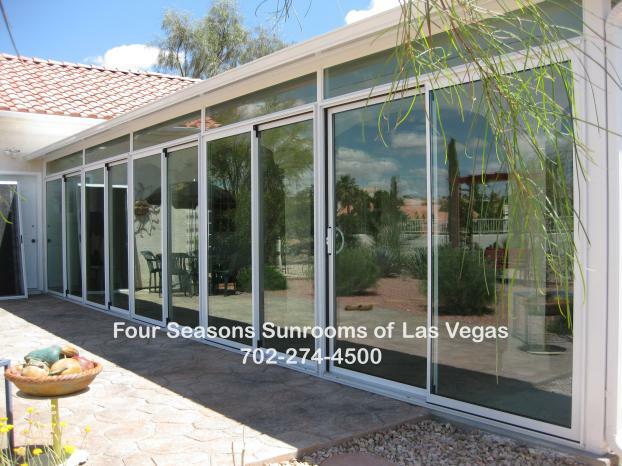 It features 4 dual sliding windows, 24" glass bottom panels, as well as 24" glass transoms. 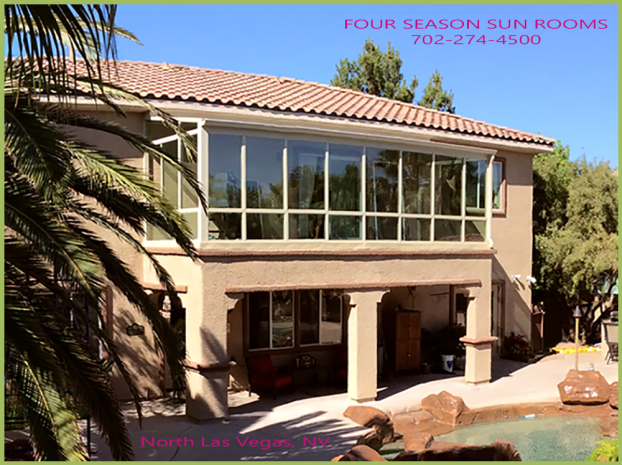 This Patio Enclosure project featured 2 dual sliding windows, 24" glass base panels, and 12" glass transoms above. We utilized white window framing materials to match the existing house window frame colors. 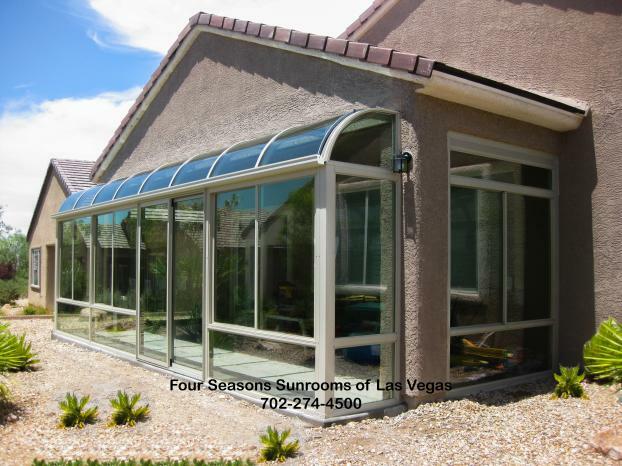 This Patio Enclosure features a sliding glass door, sliding windows, 24" glass bottom panels, and 12" transom windows above. This custom glass-wall system was designed to fit exactly into the existing patio openings, and provides year-round use of your patio area. 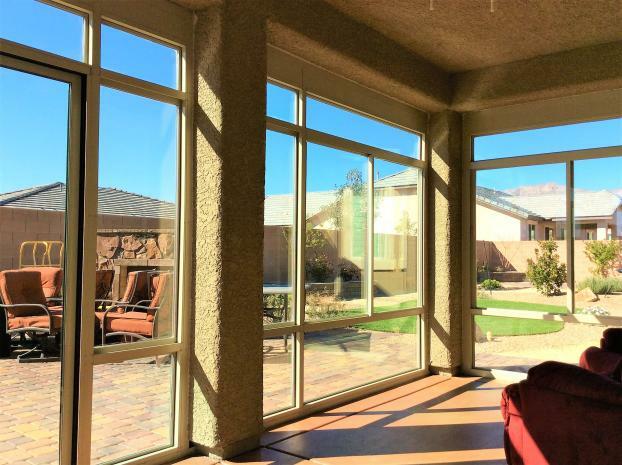 This Patio Enclosure features a combination of sliding and fixed windows, as well as a sliding glass door. 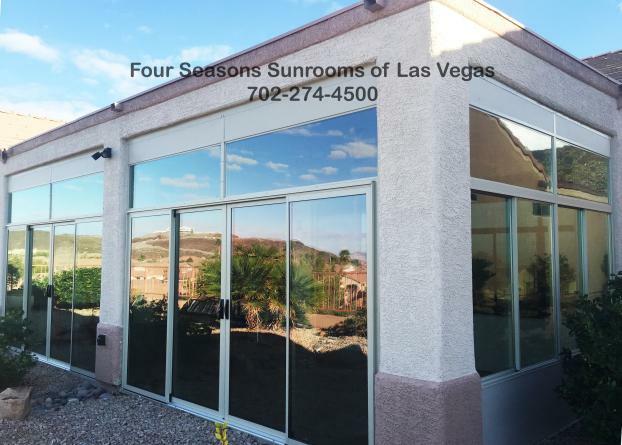 We utilized 24" glass bottom panels, and 12" glass transoms above the windows and doors. 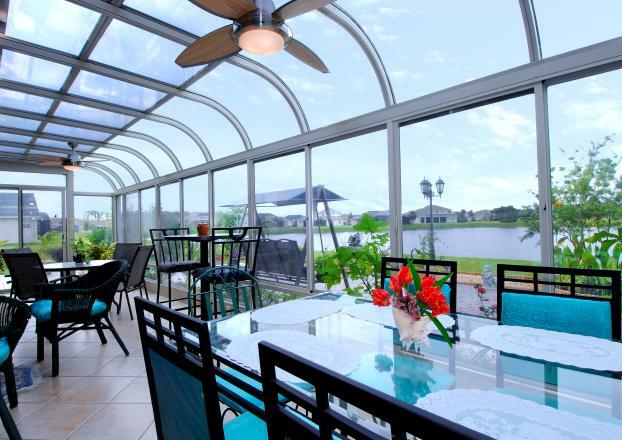 This Patio Enclosure offers great additional square footage to the rear patio. 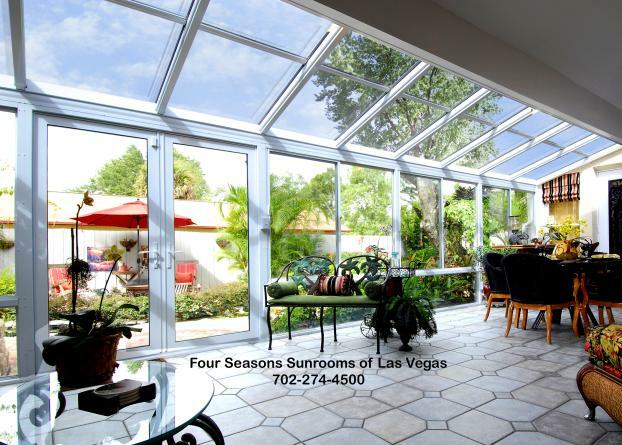 This interior view shows the openness of the patio area to the backyard, while offering a year-round climate controlled environment for Patio Enclosure. 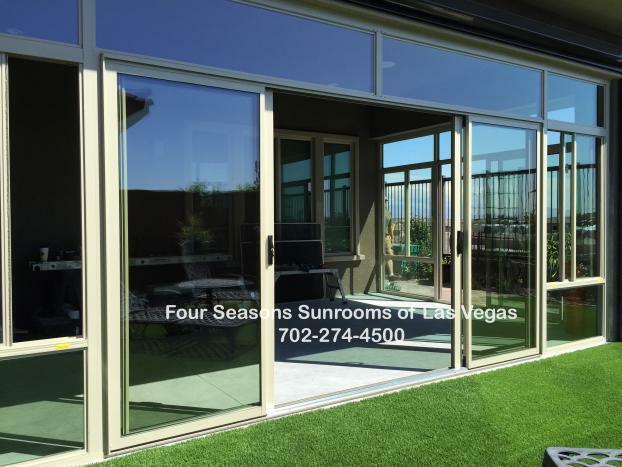 This is a Patio Enclosure that features 2 sets of 12' custom 4-panel quad doors, which always include matching screen doors. 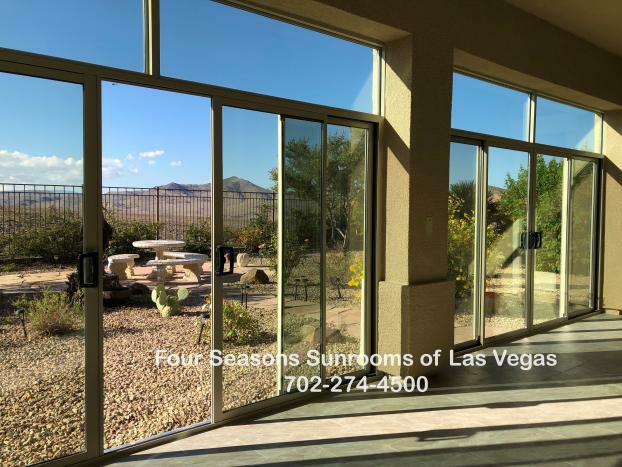 Also featured are 24" glass transoms above the doors, which really allows you to enjoy more of your backyard view year round. Extra lighting was done to enhance the Patio Enclosure. This is a view of from the hills in Henderson, looking down into the Las Vegas valley.